Back in the day, headlights were made of glass. Arguably, the first American car was invented in 1893, fourteen years before plastic was created and available for mass usage. Imagine the mess when accidents occurred and accidents happened a lot. Not to mention, the danger of shards of glass projecting toward passengers. Polycarbonate is a petroleum based material, the primary component for modern headlight covers. This substance cracks and breaks into large pieces upon impact. It is safer, but also more vulnerable to environmental changes. Over time, headlights weather, turn yellow and get foggy. Ultimately, it reduces safety and makes your vehicle look old. When your headlights are yellow and hazy, it ages the look of your vehicle. No matter how many times you have it professionally washed and waxed, it will still look old. Raleigh Window Tint Pros will have your headlights looking like you just drove it off the lot. Illumination from the bulbs is supposed to shine through the surface of your headlights. If your they are cloudy, vision is diminished and now your risk of an accident due to poor visual clarity are higher. Don’t play around with oxidized headlights, contact Raleigh Window Tint Pros for an inexpensive cleaning. If you search the Internet for DIY restoration, everything from toothpaste to a mixture of baking soda and urine will populate. These homemade solutions have minimal effect and don’t last. We have the tools and appropriate chemical compounds to get your headlights gleaming. We use two different sandpaper grits combined with a constant flow of water to remove the dead plastic. After a few rounds of cleaning, your headlights are clear as a bright blue sky. Once we apply the polish compound with a drill and pads, your headlights will shine beyond belief. The process is completed by applying a weatherized sealant. This helps prolong the appearance and minimizes deterioration from environmental conditions. The treatment time for headlight restoration is about fifteen minutes per headlight. If we treat the back break lights, you’re looking at about an hour added to your window tint process. If you’re going to invest in a vehicle wrap, you might as well go the extra mile and have your headlights restored. It will enhance the design and is well worth the money. Window tinting averages between two to four hours to apply. If our installers have to remove old tint, add an additional two to four hours. All in all, you’re looking at a five to nine hour treatment time for the complete package. We recommend that you drop off the vehicle and Uber to your next location. Polycarbonate is highly susceptible to environmental conditions. It is a safer alternative to glass, yet vulnerable to UV rays, salt, acid rain and toxic air. The end effect is oxidation which leaves a yellow, milky look. Applying a sealant to the headlight covers immediately after purchase can mitigate the oxidation process. Raleigh receives a lot of sunshine and its fair share of precipitation. If you plan on holding onto your car beyond ten years, you can expect oxidation to occur. When re-selling your vehicle, presentation goes a long way. 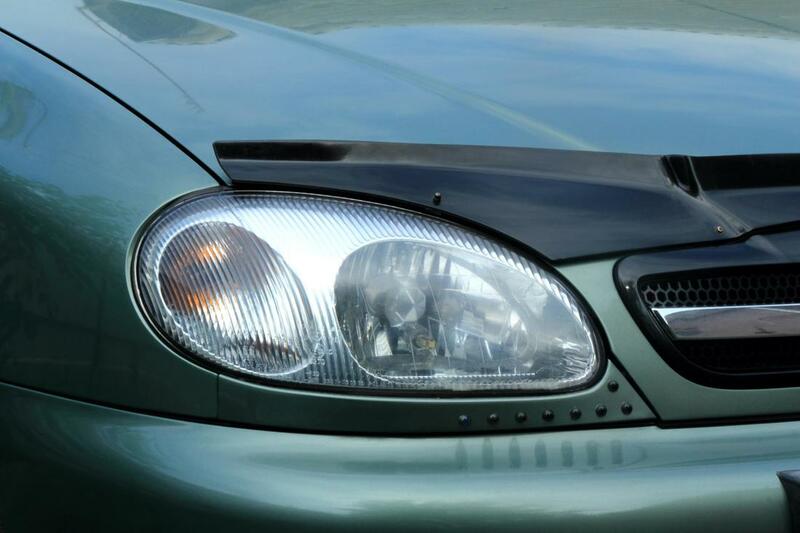 Detailing and restoring the headlights can add a thousand dollars to the resale value.